After the First World War, the Canadian militia quickly returned to a state similar to what it had known prior to the war. In the 1920s, war weariness and cuts to spending on the militia reduced manpower, training, and equipment. The regiment had to struggle to maintain its numbers, level of training, and status in the community. The 1930s showed little improvement and Canadian troops were ill-prepared for the approaching Second World War. 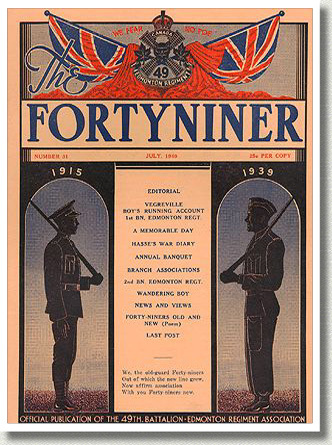 Forty-Niner, Vol. 1, Number 31, July 1940. November 1918 to March 1919 - Read about the long march home. The militia in the 1920s - Highlights include the first post-war reorganization (1920) and the formation of the Edmonton Regiment, whose 1st Battalion perpetuated the 49th, and the activities of the 49th Battalion Association. The Edmonton Regiment in the 1930s - Highlights include the Winterburn Rifle Range and Camp Harris, Lieutenant-Colonels Palmer and Harris, and summer training at Camp Sarcee. 1939 - War looms again and the Canadian army is not ready for a return to fighting.